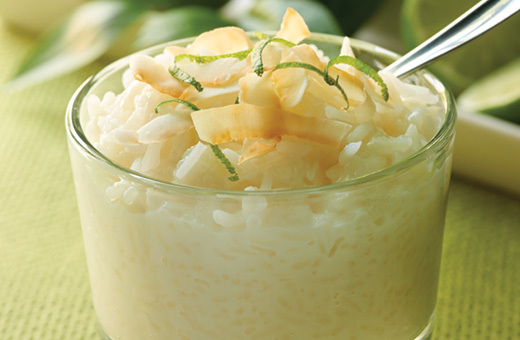 An exotic rice pudding ... made with coconut milk, fresh lime zest, and top it all off with sweetened flaked coconut. Make your family meals “gourmet” when you use Mahatma Thai Jasmine Rice. Authentic and natural, it complements your menu with exotic scent and flavor. In a bowl, soak rice in water for 20 minutes. Drain. In a 3-quart heavy saucepan, bring coconut milk, milk, sugar and rice to a gentle boil. Reduce heat and simmer, uncovered for 25 minutes, stirring occasionally. Remove from heat and add lime zest. Serve at room temperature or chilled. Sprinkle with toasted coconut, if desired. a simple and excellent recipe. try not to eat it right out the pan! i kicked mine up a notch by adding 2 8oz cans of crushed pineapple and 1/2 tablespoon of vanilla extract. FANTASTIC!